The first full-length biography of Timothy D. "Big Tim" Sullivan, who dominated New York City politics in the three decades prior to World War I. King of the Bowery is the first full-length biography of Timothy D. "Big Tim" Sullivan, the archetypal Tammany Hall leader who dominated New York City politics―and much of its social life―from 1890 to 1913. A poor Irish kid from the Five Points who rose through ambition, shrewdness, and charisma to become the most powerful single politician in New York, Sullivan was quick to perceive and embrace the shifting demographics of downtown New York, recruiting Jewish and Italian newcomers to his largely Irish machine to create one of the nation’s first multiethnic political organizations. Though a master of the personal, paternalistic, and corrupt politics of the late nineteenth century, Sullivan paradoxically embraced a variety of progressive causes, especially labor and women’s rights, anticipating many of the policies later pursued by his early acquaintances and sometimes antagonists Al Smith and Franklin D. Roosevelt. Drawing extensively on contemporary sources, King of the Bowery offers a rich, readable, and authoritative potrayal of Gotham on the cusp of the modern age, as refracted through the life of a man who exemplified much of it. 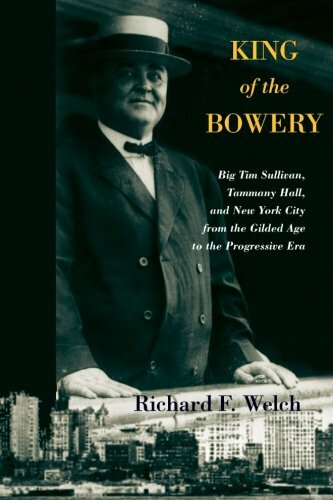 King of the Bowery is the first full-length biography of Timothy D. "Big Tim" Sullivan, the archetypal Tammany Hall leader who dominated New York City politics--and much of its social life--from 1890 to 1913. A poor Irish kid from the Five Points who rose through ambition, shrewdness, and charisma to become the most powerful single politician in New York, Sullivan was quick to perceive and embrace the shifting demographics of downtown New York, recruiting Jewish and Italian newcomers to his largely Irish machine to create one of the nation's first multiethnic political organizations. Though a master of the personal, paternalistic, and corrupt politics of the late nineteenth century, Sullivan paradoxically embraced a variety of progressive causes, especially labor and women's rights, anticipating many of the policies later pursued by his early acquaintances and sometimes antagonists Al Smith and Franklin D. Roosevelt. Drawing extensively on contemporary sources, King of the Bowery offers a rich, readable, and authoritative portrayal of Gotham on the cusp of the modern age, as refracted through the life of a man who exemplified much of it. Richard F. Welch is a historian and teaches American History, Western Civilization, and Irish History at the C. W. Post Campus of Long Island University. The author of four books and numerous articles, Welch has also worked as a historical consultant, museum exhibit curator, editor of a regional history magazine, and currently serves on the editorial board of Long Island Historical Journal. His most recent book is The Boy General: The Life and Careers of Francis Channing Barlow. He lives in Huntington, New York.